U.S. Supreme Court Justice Sonia Sotomayor speaking on campus. ON THE GREEN | From the moment she walked onto the stage to a standing ovation from an appreciative audience at the University of Delaware, U.S. Supreme Court Justice Sonia Sotomayor connected with UD’s newest students, urging them not to forget what it is to be human. 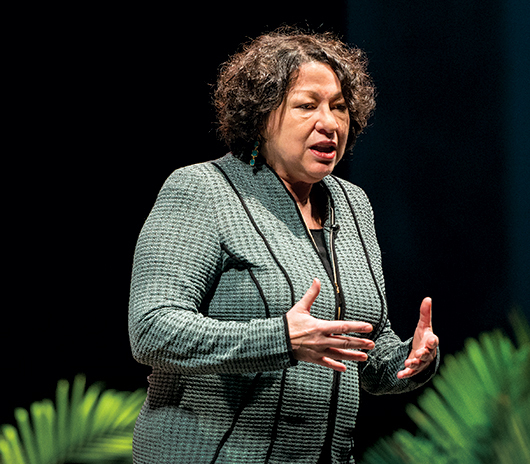 Speaking to an audience of more than 2,000—including many from the University’s Class of 2017—at the Bob Carpenter Center in September, Justice Sotomayor shared the experiences of her early life as chronicled in her memoir, My Beloved World. The presentation was part of the University’s First Year Common Reader program, in which incoming first-year students are asked to read a selected work before arriving on campus. 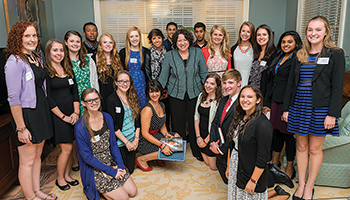 Justice Sonia Sotomayor meets with UD students. Forgoing the podium for a more intimate exchange of ideas with her audience, she remarked that a college experience represents a chance to grow individually and to share the results of that learning. Besides concentrating on meeting course requirements and planning for the future, the justice suggested that students think about things they don’t know, things they didn’t learn in high school. In quoting British historian Lord Acton’s famous dictum, “Power corrupts, and absolute power corrupts absolutely,” Justice Sotomayor cautioned against overvaluing important sounding titles and positions of prominence because important contributions are being made by people at all levels of society. My Beloved World chronicles Justice Sotomayor’s life from a Bronx housing project to the federal bench and portrays that inspiring journey, which has been marked by extraordinary determination, the power of believing in oneself and the support of mentors, friends and family. In noting that first-year students may be overwhelmed by their academic challenges and the drive to compile an impressive early college resumé, Justice Sotomayor suggested that students remember those who were a steadying influence and to keep family and friends in their lives. “One part of my book is about what people gave to me in terms of knowledge and assistance,” she said. “It’s important to learn how to give, and this may be the most difficult thing to do.” The common drive to become good at anything may also produce a certain amount of ego that clouds a person’s perspective of who they are and what their higher aims are, she said. Justice Sotomayor, who in August 2009 became the first Hispanic and third woman to sit on the Supreme Court, also fielded questions at UD from a panel that included several students. When asked how she handles the heavy workload that comes with being a Supreme Court justice, she said, “Not always well,” and credited her friends for helping her. “I try to spend meaningful time with friends, just walking and talking to another human being. It replenishes my soul,” she said.